In Dutchess County, NY, one group of noble paramedics is taking saving lives to the next level. During every shift, the heroic EMTs from the Fairway Medical Center are going above and beyond the call of duty by wearing candy necklaces for injured people to chew on as they’re being tended to! These valiant men and women work long hours for very little money, but they still take the time and effort to go the extra mile for those seeking medical attention by having sugary treats around their necks for patients to chew on at all times. 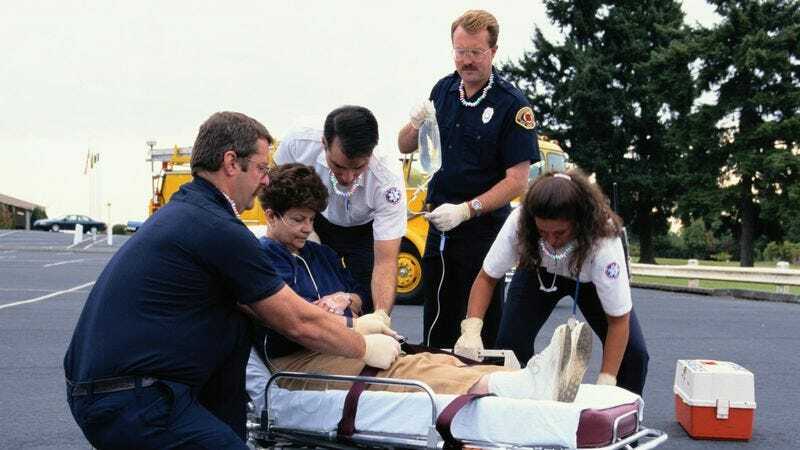 Just last week, the EMTs responded to a horrible car accident, and as they courageously stabilized the neck of one of the drivers, they also used the candy necklace’s elastic band to stretch it long enough for the patient to take a bite. Talk about being in good hands! Some situations may look bleak. But even if the patient is unconscious, these lionhearted saviors are prepared to slip the person a candy or two while performing mouth-to-mouth. And while eating the candy is optional, it’s less common to see someone turn it down than it is to see them ask for seconds. So to these heroes, we say thank you! Your humbleness knows no bounds. Keep making the world a better, sweeter place.